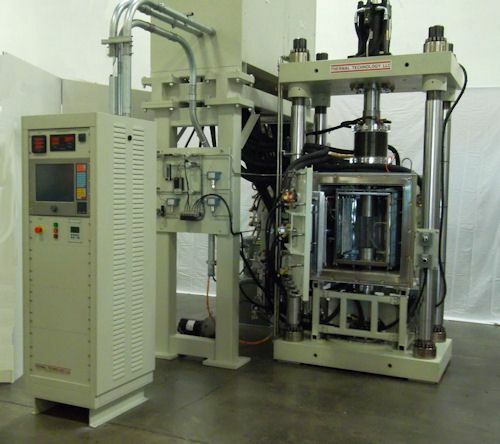 SANTA ROSA, Calif., November 21, 2012 — Thermal Technology, a leading manufacturer of vacuum and high temperature furnace systems, recently designed and manufactured a 50-ton hot press for a Northern California manufacturer of analytical instrumentation. The system will be utilized for diffusion bonding of highly advanced sensors. The hot press, Model HP100, offers a large usable work space with a 4-side molybdenum hot zone rated to 1600°C and operates in an inert gas, high vacuum or partial pressure environment. Thermal Technology’s Model HP100-121214M provides a spacious 12-inch cube work area with a convenient front and rear door loading configuration, permitting direct and unrestricted access to the work area. This system offers precision force control and displacement measurement with accuracy of better than 0.5% of reading. The control system utilizes the Honeywell HC900 Hybrid controller and advanced HMI software to provide automatic turn-key batch control and data acquisition. Thermal Technology’s hot press systems are designed for the simultaneous application of high temperature and high force levels. Primary applications include densification of powdered materials, diffusion bonding of solid components and processing of fibrous composites. Thermal Technology designs and manufactures crystal growing systems and high temperature vacuum and controlled atmosphere laboratory and production furnaces for the advanced processing of metals, ceramics, glass, quartz and crystal growing applications. Thermal Technology has over 60 years of experience and more than 3000 installations in 40 countries.